In this dazzling new novel, Emily Giffin, the #1 New York Times bestselling author of Something Borrowed, Where We Belong, and The One & Only introduces a pair of sisters who find themselves at a crossroads. Growing up, Josie and Meredith Garland shared a loving, if sometimes contentious relationship. Josie was impulsive, spirited, and outgoing; Meredith hardworking, thoughtful, and reserved. When tragedy strikes their family, their different responses to the event splinter their delicate bond. Fifteen years later, Josie and Meredith are in their late thirties, following very different paths. Josie, a first grade teacher, is single—and this close to swearing off dating for good. What she wants more than the right guy, however, is to become a mother—a feeling that is heightened when her ex-boyfriend's daughter ends up in her class. Determined to have the future she's always wanted, Josie decides to take matters into her own hands. On the outside, Meredith is the model daughter with the perfect life. A successful attorney, she's married to a wonderful man, and together they're raising a beautiful four-year-old daughter. Yet lately, Meredith feels dissatisfied and restless, secretly wondering if she chose the life that was expected of her rather than the one she truly desired. As the anniversary of their tragedy looms and painful secrets from the past begin to surface, Josie and Meredith must not only confront the issues that divide them, but also come to terms with their own choices. In their journey toward understanding and forgiveness, both sisters discover they need each other more than they knew . . . and that in the recipe for true happiness, love always comes first. Emotionally honest and utterly enthralling, First Comes Love is a story about family, friendship, and the courage to follow your own heart—wherever that may lead. When we first meet the Garland family, they seem to be a happy family with three adult children and no major worries in the world. Then tragedy strikes and the family is torn apart rather than brought closer together. 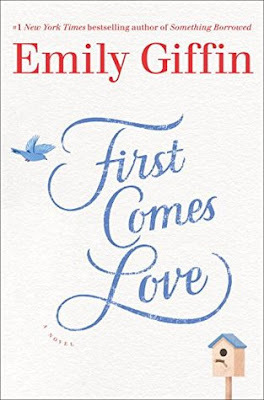 Sisters Josie and Meredith have taken totally different paths over the past fifteen years and both feel as if there is something missing in Emily Giffin's latest, First Comes Love. Josie Garland is the middle child and can't live up to her eldest brother's legacy of being super smart and kind. Her younger sister, Meredith, is making her own way in life by studying theater arts. When we meet Josie and Meredith, they are in their early twenties and still searching for their paths in lives. Their lives, indeed their entire family is turned upside down after the tragic death of their older brother in a car accident. Meredith graduates with a degree in Theater Arts but opts for law school. Josie graduates with a degree in education and becomes a first-grade teacher. Meredith winds up married to her brother's best friend and the mother of a four-year-old. Josie is living with her best friend, her male best friend, and still single. As Josie gets closer to her 38th birthday, she decides to pursue motherhood even if it means being a single mother. Meredith is having her own mid-life crisis, and wonders if she made the right decision to marry her husband and if she should stay married. She doesn't want more children and her husband wants at least two or three more. Both Josie and Meredith are dealing with a lot of stressors and sadly, they don't have one another to turn to as they epitomize sibling rivalry even in their adult relationship. Just when it seems like their relationship might wind up getting better, a secret is revealed that might tear them apart forever. 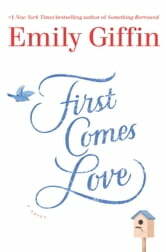 I found First Comes Love to be a fast-paced and engrossing read. I was intrigued by the relationship between Josie and Meredith, as they both seemed to constantly find fault with one another no matter the situation. The relationship between these two sisters was probably more realistic than not, as not all siblings like each other even if they do love one another. As someone that has had to deal with the death of a sibling in adulthood, I was interested to see how the evolution/devolution of the family would play out. I liked both Josie and Meredith, especially Josie's extroverted nature compared to Meredith's introverted nature. Although Josie and Meredith don't seem to get along due to their entrenched sibling rivalry, jealousy seems to be at the heart of their problems with each other. First Comes Loves spans only a few months in the adult lives of Josie and Meredith, but there's a lot crammed into those few months. Ms. Giffin has crafted a story that provides tragedy, turmoil, drama, hints of romance, and a sense of hopefulness throughout it all. 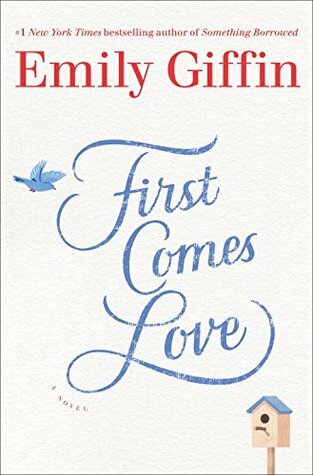 If you want to read a realistic story about siblings and family that has a hopeful ever after thread woven throughout, then you'll definitely want to grab a copy of First Comes Love. I recommend waiting until you have the weekend to binge read this book because you won't want to put it down. Disclaimer: I received a print advanced reader copy of this book from the publisher. I was not paid, required, or otherwise obligated to write a positive review. The opinions I have expressed are my own. I am disclosing this in accordance with the Federal Trade Commission's 16 CFR, Part 255: "Guides Concerning the Use of Endorsements and Testimonials in Advertising."